Italian furniture brands Cassina and Molteni&C are locked in a legal battle over who has the rights to a 1950s design by architect Gio Ponti, after they both showed the chair at Milan design week. Both parties claim to own the rights to the chair, known as the D.156.3 at Molteni&C and the 811 to Cassina. 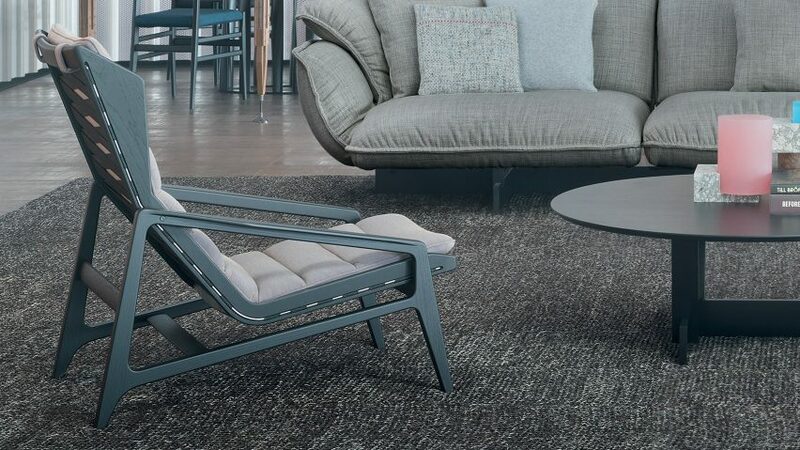 Molteni&C introduced the chair – a wooden lounger with a slightly winged headrest – this week as part of its new product launches at Milan design week. While Cassina has not put the chair into production, it has displayed a version of it on its showroom floor for some time, and contends it was "conceived, engineered and produced" in its own factory "in co-operation" with Ponti in the 1950s. The conflict entered the public arena on Monday, when Cassina placed a newspaper advertisement describing its 811 chair as "the original" designed by Ponti and Cassina. In response Molteni&C issued a statement saying it was "surprised to learn" of Cassina's advertising campaign and that it was taking action to enforce its exclusive rights to the design, obtained in 2010 from Ponti's heirs. "Molteni&C S.p.A. points out that the model in question, named D.156.3 in agreement with the Ponti Heirs, was designed by Gio Ponti and is the object of an exclusive manufacturing and marketing licence granted to Molteni&C S.p.A. by the Ponti Heirs within the context of a partnership set up in 2010 and still in force today," said Molteni&C. "While insisting that it is the only company authorised to use the design in question, Molteni&C S.p.A. wishes it to be known that it has already applied to the Judicial Authorities in order to safeguard its rights." Cassina's managing director, Gianluca Armento, has confirmed with Dezeen that the matter will enter legal proceedings. "The 811 armchair was conceived, engineered and produced by Cassina in the 1950s in cooperation with Gio Ponti," he said. "Today the 811 is not yet on sale. We are awaiting to resolve the issue through legal channels in order to legitimately produce the armchair." He said Monday's newspaper ads had been placed as "a celebration of Cassina and the company's history". Cassina is celebrating its 90th birthday this year with the launch of several new products and a monograph at Milan design week, which began on Monday and runs until April 9. The company owns several designs by Ponti, one of Italy's most influential designers and architects, who passed away in 1979 at the age of 87. Any legal case will likely rest on who has the true ownership over the design, and on the details of contractual agreements between Ponti, his heirs, Cassina and Molteni&C. Both companies are among the heavyweight players in the Italian design industry. Molteni&C was founded in 1934, making it 83 years old this year. The brands have recently been revived by new international creative directors – Cassina by Patricia Urquiola and Molteni&C by Vincent Van Duysen – which propelled Cassina to a spot on Dezeen Hot List last year.